Here at Kidliterati, we have done a long series called Reaching Readers. We've talked about ways to engage with young book lovers. The ideas are wide ranging, but the simplest and most direct way we engage readers is through books themselves. It's a remarkable thing -- words on the page create an environment in which a young mind grows. Miriam Spitzer Franklin reached out to us to share a special book review by Dominic, one of her 7th grade students. She wanted to tell us how Dominic has grown as a reader and writer this year. "He is an avid reader of historical fiction, especially about World War II. He's also a talented creative writer. Perhaps he'll have his own books published someday!" 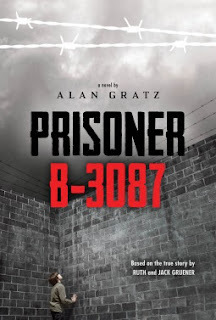 Prisoner B-3087, by Alan Gratz, is about a teenage Polish Jew in the 1940’s during World Two who is sent to a death camp during the Nazi occupation. The main problem that Yanek faces is SURVIVAL. His daily struggle is to survive, from gas chambers to being shot, to malnourishment to disease and sickness as it spreads through the camp like wildfire. Survival is Yanek’s only option even though it seems impossible to fifteen-year-old Yanek. I really like Yanek in this book as it explains his daily struggle in a Nazi occupation concentration camp. This character is fearless by standing up to a Nazi monster like SS Conrod Goeth. He is so strong as he tries to fight with every little strength he has left in his body, through days that feel like he's stuck in a horror movie. But sadly, Yanek faces lots of problems. He loses his family early on in the book to the Nazis. That has been very hard for Yanek to face and recover. Another problem is when Yanek loses his Uncle Moshe in a concentration camp. Yanek shows many emotions, fearless being one and being scared and horrified are others. And of course, he faces sadness as Yanek loses pretty much his whole family. What I like most about the main character is how brave and strong he is. This book is so powerful in emotion and sadness. This book is so interesting and exciting and leaves you on a bunch of cliffhangers. That is why I kept turning the pages. It always made me want to skip ahead and see what will happen to Yanek. I chose this quote from the book because of how important it is for 15-year-old Yanek to survive under Nazi control. Yanek has to survive. He’s already come this far. I give this book a great rating of five stars. This was for sure the best I’ve ever read. If you really want a feel for what the Jews actually went through in World War Two, you will love this book. Good work Dominic. We are very proud of you and your hard-work this year. The future is bright for you.